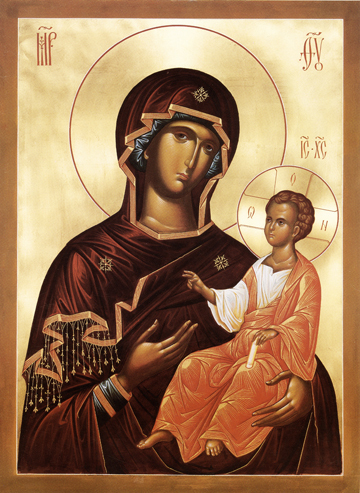 This icon is in the pattern or type of icons known as “Hodegetria” or Directress, showing the Virgin Mother leading, by the gesture of her hand, the souls of all mankind to the Author of our Salvation, Our Lord Jesus Christ. As she directs us to piety and love for Our Lord, He blesses us with the blessing of His right hand for all of our endeavors that are brought to Him in faith, for He will help us do all that we wish to do in goodness, and for the Glory of God. The Lord is good, truly Good indeed, and so all that He touches and blesses becomes good also. Christ here is shown with an awareness and perception beyond that of a child, which is the reason that His face is usually depicted older than His physical years in the icons, but with the full understanding that He is the God of Heaven and of earth. As we learn to treat Him thus, we really become His loving children. This egg-tempera masterpiece icon is a remarkable blend of Russian and Byzantine iconography in modern times, and was painted by Father Andrei in 1992 for the chapel dedicated to the Elders of Optina at Holy Trinity Monastery in Jordanville, New York.